Online marketing doesn’t have to be complicated. Honestly, it really doesn’t! But it should be something you understand and have a good handle on if you want to enjoy the huge benefits it can bring to your business. It doesn’t matter what kind of business you have, or how big (or small) it is, if someone is looking for a product/service that you offer, chances are their search will begin on the internet. Gone are the days of those big, chunky, yellow books or those local directories being the first reference source when we’re looking for an expert. These days, it’s not about your fingers doing the walking, it’s all about checking Google and finding out heaps of valuable information about a business (in an instant) before making that first contact. So whether you’re just starting out, or you’ve been marketing for a while and in a bit of a rut, spend a few minutes reading through this article because it could help you find an approach that will work best for you and your business. Let’s start by looking at some of the top benefits of online marketing and which tasks you should prioritise if you’re struggling for time. It’s cost effective – compared to advertising in newspapers and magazines. You can reach a potentially HUGE audience, all over the world. It makes best use of your time – you can automate a lot of your content so it’s a long-term time investment. Online marketing can bring instant results. It allows you to get in front of your crowd and build relationships without necessarily meeting face to face. Your marketing efforts are your silent salesperson, working 24/7 for you. Have a Website that Wows!!! And don’t forget SEO & blogging either. Having a website that is user-friendly, easy to navigate, is packed with great content (and copy), shows people what it’s like to work with you/buy from you, has great images that reflect your brand, and ticks all those SEO boxes should always be a priority for any business. 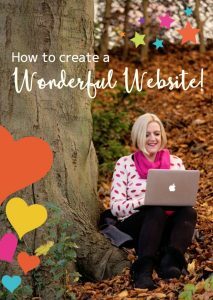 If you need a hand, take a look at my web design services here or if you’d like to design your own site find out more about my online programme here. SEO doesn’t necessarily have to be a paid-for luxury that costs you a fortune every month. You can learn to do lots of it yourself… there are some free tips over here some fantastic tips here from the copyblogger himself: http://www.copyblogger.com/seo-copywriting/ and boost your SEO yourself with a time-investment only.